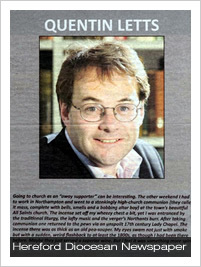 Late in 2011 eagle-eyed members of the congregation spotted a familiar visitor, and in the Winter edition of the Hereford Diocesan newspaper, his report on our activities was published under a column about the St Paul’s Cathedral “affair” and the Prayer Book Society’s Cranmer awards. We are of course delighted with Mr Letts’ kind comments – of course in a town of Northampton’s proportions, there should surely be room for Churches of all traditions; from low to high, traditional to innovative, and old to new. We believe that our combination of the orthodox and catholic traditions of the Church of England has something special to offer, and despite a very long interregnum, our numbers are UP! However, we must note that the Lady Chapel was erected after the First World War and is both a Memorial Chapel to the Fallen and to Our Lady, and that the Northants burr came from our Churchwarden, Mr David White, who was dressed verger-like as the morning’s MC.